A drama about destiny, connections, and passion, the 2014 French film 3 Hearts presents a headily romantic look at a classic love triangle. One night in provincial France, Marc (Benoît Poelvoorde, My Worst Nightmare) meets Sylvie (Charlotte Gainsbourg, The City of Your Final Destination) after missing his train back to Paris. Instantly and intensely drawn to one another, they wander through the streets until morning. A thwarted plan for a second meeting sends each in a separate direction – Sylvie reunites with her ex and leaves France; Marc falls in love and marries. What neither knows is that Marc’s new bride is Sylvie’s sister, Sophie (Chiara Mastroianni, Park Benches). Uh-oh…! 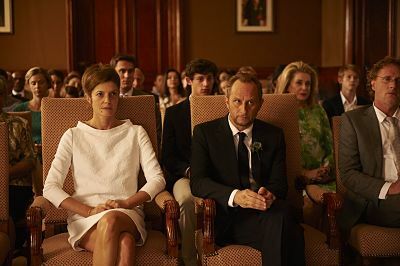 Directed by Benoit Jacquot (Farewell, My Queen), the 2014 movie received a limited release to U.S. theaters in the spring of 2015 to positive critical response, garnering a 73% positive response at Rotten Tomatoes based on 26 published reviews. Presented in French with English subtitles, the DVD and Blu-ray of the film contain an interview with the director and a theatrical trailer.